Astronomers have for the first time directly imaged a fast-moving jet of material ejected as a supermassive black hole consumed a star. Scientists have previously detected a few cases of black holes destroying stars, but this is the first time they have imaged a bright jet of material from the event. The way the jets were detected means researchers are hopeful they can spot more similar events. Such events may have been more common in the early universe, so studying them may help scientists understand the environment in which galaxies developed billions of years ago. The results, led by the University of Turku in Finland and the Astrophysical Institute of Andalucia in Spain, and including Imperial College London researchers, are published online today in the journal Science. Only a small number of this kind of stellar deaths, called tidal disruption events (TDEs), have been detected. 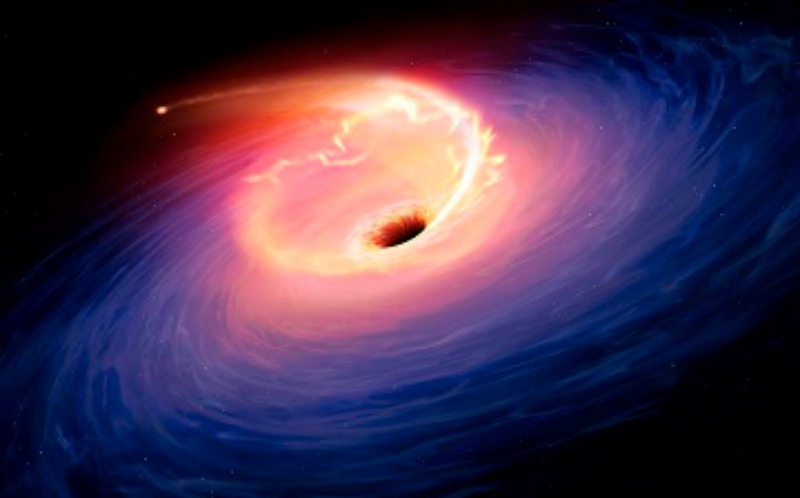 Physicists thought that material pulled from the doomed star would form a rotating disk around the black hole, emitting intense X-rays and visible light, and also launch jets of material outward from the poles of the disk at nearly the speed of light. Now, these jets have been observed as a black hole, which is 20 million times more massive than our Sun, shredded a star more than twice the Sun’s mass. 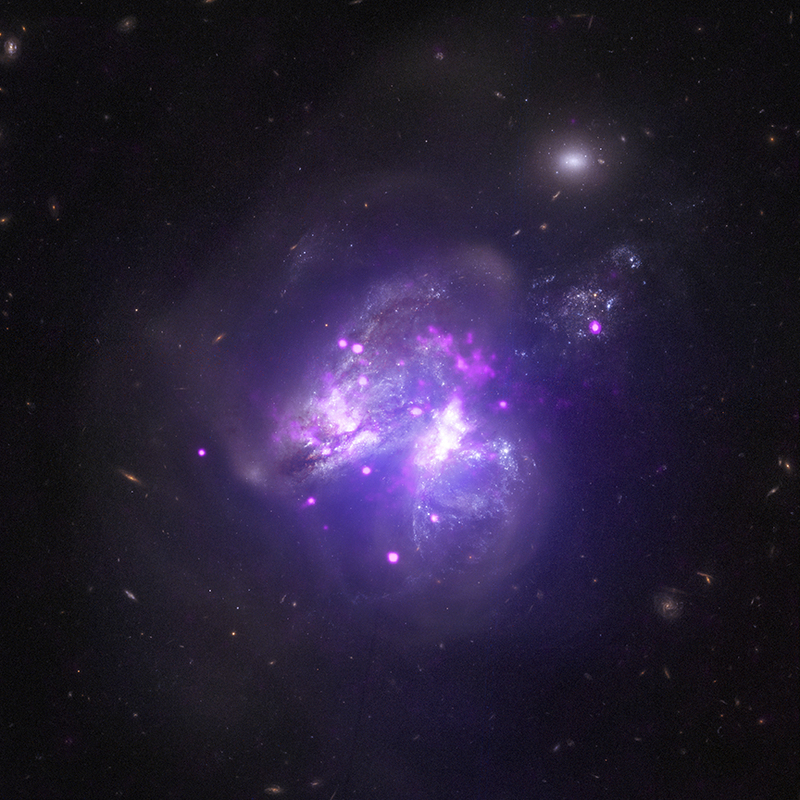 Astronomers tracked the event with radio and infrared telescopes in a pair of colliding galaxies called Arp 299, nearly 150 million light-years from Earth. Astronomers using the William Herschel Telescope in the Canary Islands had discovered a bright burst of infrared emission coming from one of the colliding galaxies in Arp 299. Follow-up observations with the National Science Foundation’s Very Long Baseline Array (VLBA) revealed a new, distinct source of radio emission from the same location. Infrared and radio waves are those emitted beyond the visible light spectrum. The astronomers had expected to see visible light and X-rays (below the visible spectrum) created by the TDE, but think they only observed infrared and radio waves because of the amount of dust in the galaxy. When our Milky Way galaxy and neighboring Andromeda galaxy collide, supermassive black holes will have a feast! 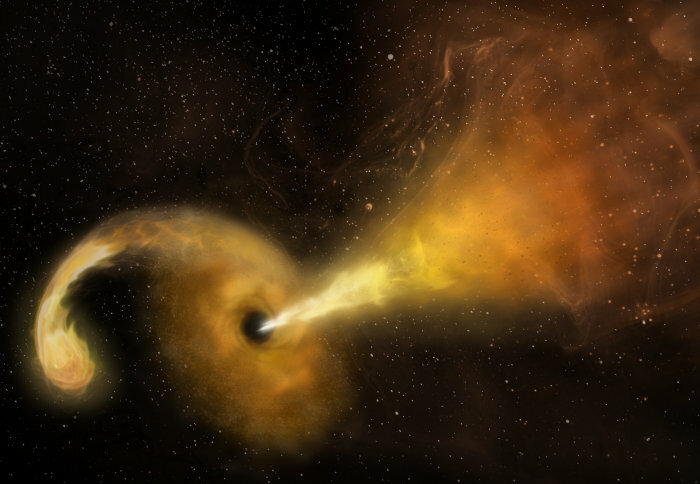 Artist’s concept of a Tidal Disruption Event, in which a black hole eats a star, in the distant galaxy F01004-2237. As the black hole swallows the star, there’s a release of gravitational energy from the star’s debris. The result is a visible flare. Image via Mark Garlick. 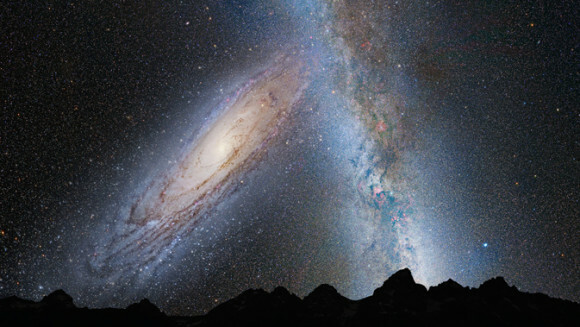 What’ll our sky look like 5 billion years from now, when our Milky Way galaxy merges with the nearby Andromeda galaxy? If there are any people left to look then [this is false, there will be no people, as our sun will hve in 3 billion years grown into a red giant, consumed Mercury and Venue, and at least fried Earth before eating it] they’ll be able to see flares about every 10 to 100 years, each time our Milky Way’s central supermassive black hole swallows a star. The flares will be visible to the unaided eye [forget it, but still you need to pay your taxes]. They’ll appear much brighter than any other star or planet in the night sky. That’s according to astronomers at the University of Sheffield in England, who say that central, supermassive black holes in colliding galaxies swallow stars some 100 times more often than previously thought. Their study was published March 1, 2017 in the peer-reviewed journal Nature Astronomy. The study is based on a survey of just 15 galaxies, a very small sample size by astronomical standards. However, in that small sample, the astronomers were surprised to see a black hole swallow a star. Astronomers call this sort of event a tidal distruption event, or TDE. They’d been only been only seen before in surveys of many thousands of galaxies, leading astronomers to believe they were exceptionally rare: only one event every 10,000 to 100,000 years per galaxy. Artist’s concept of Earth’s night sky in 3.75 billion years. The Andromeda galaxy (left) will fill our field of view then, astronomers say, as it heads toward a collision, or merger, with our Milky way galaxy. Image via NASA; ESA; Z. Levay and R. van der Marel, STScI; T. Hallas; and A. Mellinger. “Our team first observed the 15 colliding galaxies in the sample in 2005, during a previous project. Galaxy F01004-2237 – which is 1.7 billion light years from Earth – had flared in a way characteristic of TDEs. These events are known to cause flaring due to energy release, as a star edges toward a galaxy’s central, supermassive black hole. 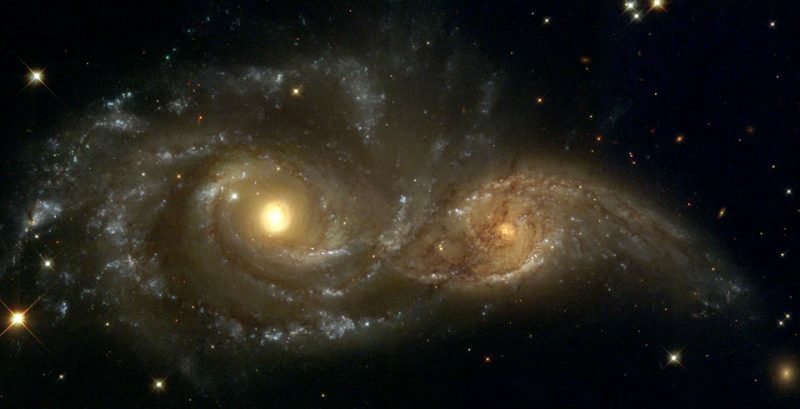 NGC 2207 and IC 2163 are two spiral galaxies in the process of merging, or colliding. If the new study from University of Sheffield is correct, there is a much greater chance for stars to be eaten in these galaxies by their central, supermassive black holes. Bottom line: A study from the University of Sheffield shows that collisions – like that predicted for our Milky Way galaxy and neighboring Andromeda galaxy – cause black holes to eat stars some 100 times faster than previously thought.